It’s hard to imagine anyone using CRT displays anymore, especially when LED TVs and monitors have been dominating the market for over a decade. There’s something to be said about those old bulky though, a feeling of nostalgia perhaps, certainly so when playing old Nintendo games. Bitluni must have felt that same nostalgia when he designed the CRT Boy — a portable Game Boy clone that features a tiny black and white CRT display. Bitluni started the project when he was gifted the display from a fan, which previously saw life as part of an intercom system. Strangely enough, the XG680F 4-inch CRT was manufactured in 2007 and includes JST inputs for both video signal and power, which made it easy to connect to the SEP32 microcontroller that drives the gaming console. Bitluni cannibalized some of the intercom’s other parts, like the speaker and pots, which is used to control the CRT Boys audio, brightness, and contrast. Powering the CRT Boy is a 12V LiPo battery, which is scaled-down to 5V using a regulator that acts to curb some of the electronic noise as well. In keeping with the Game Boy motif, Bitluni gutted the hardware out of an NES controller and packed the entire build into an excellent giant 3D-printed case. The CRT Boy is also equipped with an on/off switch and an off-the-shelf charging circuit with USB port, making it easy to recharge the console. Bitluni tested the console with a SpaceX Tetris clone and found he needed to tweak the software to help better fit the CRT display. When all was said and done, the self-proclaimed maker designed a fantastic console build that he can take anywhere. 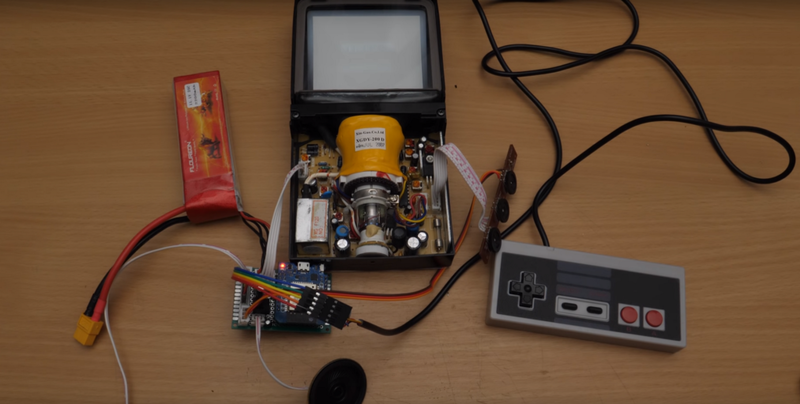 Build a Game Boy Clone with an ESP32 and a Small CRT Display was originally published in Hackster Blog on Medium, where people are continuing the conversation by highlighting and responding to this story.